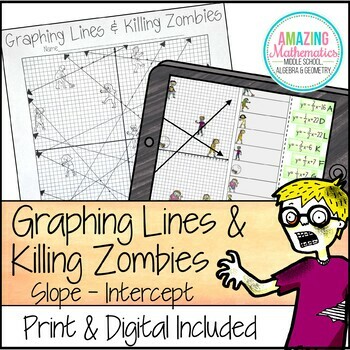 This zombie themed graphing linear equations activity will strengthen your students’ skills at graphing in slope intercept form. After many requests a "Catching Zombies" version has been added. It's the exact same activity and problems but replaces the word "Killing" for "Catching". It's included in the resource download after purchase. Students are given a graph with 12 zombies on it and 12 y=mx+b equations. 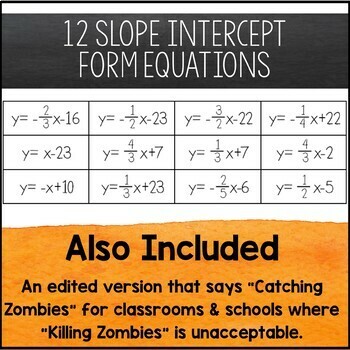 Students will cut out each equation and graph the line on the zombie graph. They will then glue the equation next to the zombie that it “killed”. Zombies are “killed” when a line runs through any part of their body. 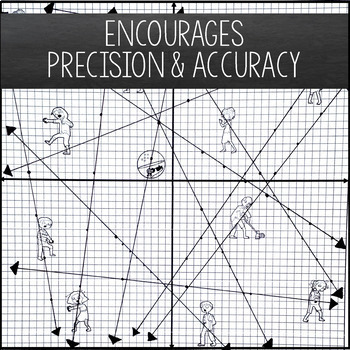 Precision is key in this activity as each line should only run through 1 zombie. 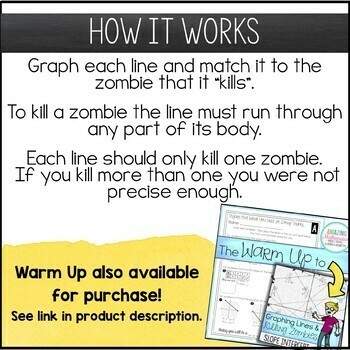 If a line runs through more than 1 zombie the student was not precise enough. Please view the preview for an exact picture of the completed activity.